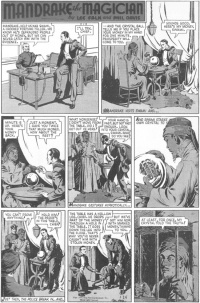 "The Clairvoyant" is the 5th Mandrake filler page in between the 10th and 11th Sunday story. The story was written by Lee Falk and drawn by Phil Davis. Swami had defrauded people out of money and the Police chief asked Mandrake to help nab him. When visiting Swami, Swami said, ".. and the crystal ball tells me if you place your money in my hand for one minute, prosperity will come to you". When Swami returned the money Mandrake found that he only gave back half of it. Mandrake gestures hypnotically.. And in the crystal ball Swami see himself behind the bars. Chief, first apparance of the Police Chief ? This page was last edited on 5 March 2017, at 17:39.